This article is about rechargeable lithium-ion batteries. For disposable primary lithium batteries, see Lithium battery. "Lithium-ion" redirects here. For the metal element, see Lithium. Lithium-ion batteries are common rechargeable batteries for portable electronics, with a high energy density, no memory effect (other than LFP cells) and low self-discharge. LIBs are also growing in popularity for military, battery electric vehicle and aerospace applications. 2 or NMC) offer lower energy density but longer lives and less likelihood of fire or explosion. Such batteries are widely used for electric tools, medical equipment, and other roles. NMC in particular is a leading contender for automotive applications. Lithium-ion batteries can be a safety hazard since they contain a flammable electrolyte and may become pressurized if they become damaged. A battery cell charged too quickly could cause a short circuit, leading to explosions and fires. Because of these risks, testing standards are more stringent than those for acid-electrolyte batteries, requiring both a broader range of test conditions and additional battery-specific tests, and there are shipping limitations imposed by safety regulators. There have been battery-related recalls by some companies, including the 2016 Samsung Galaxy Note 7 recall for battery fires. Another problem can occur if a lithium-ion battery is damaged or crushed, or if a battery without overcharge protection is subjected to a higher electrical load than it can safely handle. Additionally, an external short circuit can trigger the batteries to explode. Research areas for lithium-ion batteries include life extension, energy density, safety, cost reduction, and charging speed, among others. Research has also been under way for aqueous lithium-ion batteries, which have demonstrated fewer potential safety hazards due to their use of non-flammable electrolytes. A cell is a basic electrochemical unit that contains the electrodes, separator, and electrolyte. A battery or battery pack is a collection of cells or cell assemblies, with housing, electrical connections, and possibly electronics for control and protection. For rechargeable cells, the term cathode designates the electrode where reduction is taking place during the discharge cycle. For lithium-ion cells the positive electrode ("cathode") is the lithium-based one. Lithium batteries were proposed by British chemist M Stanley Whittingham, now at Binghamton University, while working for Exxon in the 1970s. Whittingham used titanium(IV) sulfide and lithium metal as the electrodes. However, this rechargeable lithium battery could never be made practical. Titanium disulfide was a poor choice, since it has to be synthesized under completely sealed conditions, also being quite expensive (~$1000 per kilogram for titanium disulfide raw material in 1970s). When exposed to air, titanium disulfide reacts to form hydrogen sulfide compounds, which have an unpleasant odour and are toxic to most animals. For this, and other reasons, Exxon discontinued development of Whittingham's lithium-titanium disulfide battery. Batteries with metallic lithium electrodes presented safety issues, as lithium is a highly reactive element; it autoignites exposed to normal atmospheric conditions because of spontaneous reactions with water and oxygen. As a result, research moved to develop batteries in which, instead of metallic lithium, only lithium compounds are present, being capable of accepting and releasing lithium ions. Reversible intercalation in graphite and intercalation into cathodic oxides was discovered during 1974–76 by J. O. Besenhard at TU Munich. Besenhard proposed its application in lithium cells. Electrolyte decomposition and solvent co-intercalation into graphite were severe early drawbacks for battery life. 1973 – Adam Heller Proposed the lithium thionyl chloride battery, still used in implanted medical devices and in defense systems where greater than a 20-year shelf life, high energy density, or extreme operating temperatures are encountered. 6) to provide an alternative to the lithium metal electrode battery. 1980 – Rachid Yazami demonstrated the reversible electrochemical intercalation of lithium in graphite. The organic electrolytes available at the time would decompose during charging with a graphite negative electrode, slowing the development of a rechargeable lithium/graphite battery. Yazami used a solid electrolyte to demonstrate that lithium could be reversibly intercalated in graphite through an electrochemical mechanism. (As of 2011, the graphite electrode discovered by Yazami is the most commonly used electrode in commercial lithium ion batteries). 1982 – Godshall et al. were awarded the U.S. Patent on the use of LiCoO2 as cathodes in lithium batteries, based on Godshall's Stanford University Ph.D. thesis Dissertation and 1979 publications. 1983 – Michael M. Thackeray, John B. Goodenough, and coworkers further developed manganese spinel as a positive electrode material, after its 1979 identification as such by Godshall et al. in 1979 (above). Spinel showed great promise, given its low-cost, good electronic and lithium ion conductivity, and three-dimensional structure, which gives it good structural stability. Although pure manganese spinel fades with cycling, this can be overcome with chemical modification of the material. As of 2013, manganese spinel was used in commercial cells. 2 enabled industrial-scale production and represents the birth of the current lithium-ion battery. 1989 – John Goodenough and Arumugam Manthiram of the University of Texas at Austin showed that positive electrodes containing polyanions, e.g., sulfates, produce higher voltages than oxides due to the induction effect of the polyanion. 1996 – Akshaya Padhi, KS Nanjundawamy and John Goodenough of the University of Texas at Austin identified LiFePO4 (LFP) as cathode material for Lithium ion Batteries. There were two main trends in the research and development of electrode materials for lithium ion rechargeable batteries. One was the approach from the field of electrochemistry centering on graphite intercalation compounds, and the other was the approach from the field of new nano-carbonaceous materials. The negative electrode of today’s lithium ion rechargeable battery has its origins in PAS (polyacenic semiconductive material) discovered by Tokio Yamabe and later by Shjzukuni Yata in the early 1980s. The seed of this technology, furthermore, was the discovery of conductive polymers by Professor Hideki Shirakawa and his group, and it could also be seen as having started from the polyacetylene lithium ion battery developed by Alan MacDiarmid and Alan J. Heeger et al. The performance and capacity of lithium-ion batteries increases as development progresses. 1991 – Sony and Asahi Kasei released the first commercial lithium-ion battery. 4) and other phospho-olivines (lithium metal phosphates with the same structure as mineral olivine) as positive electrode materials. 2001 – Zhonghua Lu and Jeff Dahn file a patent for the lithium nickel manganese cobalt oxide (NMC) class of positive electrode materials, which offers safety and energy density improvements over the widely used lithium cobalt oxide. 2002 – Yet-Ming Chiang and his group at MIT showed a substantial improvement in the performance of lithium batteries by boosting the material's conductivity by doping it with aluminium, niobium and zirconium. The exact mechanism causing the increase became the subject of widespread debate. 2004 – Chiang again increased performance by utilizing lithium iron(II) phosphate particles of less than 100 nanometers in diameter. This decreased particle density almost one hundredfold, increased the positive electrode's surface area and improved capacity and performance. Commercialization led to a rapid growth in the market for higher capacity LIBs, as well as a patent infringement battle between Chiang and John Goodenough. 2011 – lithium-ion batteries accounted for 66% of all portable secondary (i.e., rechargeable) battery sales in Japan. 2012 – John Goodenough, Rachid Yazami and Akira Yoshino received the 2012 IEEE Medal for Environmental and Safety Technologies for developing the lithium ion battery. 2014 – commercial batteries from Amprius Corp. reached 650 Wh/L (a 20% increase), using a silicon anode and were delivered to customers. The National Academy of Engineering recognized John Goodenough, Yoshio Nishi, Rachid Yazami and Akira Yoshino for their pioneering efforts in the field. As of 2016[update], global lithium-ion battery production capacity was 28 gigawatt-hours, with 16.4 GWh in China. In 2015 cost estimates ranged from $300–500/kWh[clarification needed]. In 2016 GM revealed they would be paying US$145/kWh for the batteries in the Chevy Bolt EV. Information came to light in 2011 regarding a long-term antitrust violating price-fixing conspiracy among the world's major lithium-ion battery manufacturers that kept prices artificially high from 2000 to 2011, according to a class action complaint that was tentatively settled with one of the defendants, Sony, in 2016. The complaint provided evidence that participants included LG, Samsung SDI, Sanyo, Panasonic, Sony, and Hitachi, and notes that Sanyo and LG had "pled guilty to the criminal price-fixing of Lithium Ion Batteries". Cylindrical Panasonic 18650 lithium-ion battery cell before closing. The three primary functional components of a lithium-ion battery are the positive and negative electrodes and electrolyte. Generally, the negative electrode of a conventional lithium-ion cell is made from carbon. The positive electrode is a metal oxide, and the electrolyte is a lithium salt in an organic solvent. The electrochemical roles of the electrodes reverse between anode and cathode, depending on the direction of current flow through the cell. The most commercially popular negative electrode is graphite. The positive electrode is generally one of three materials: a layered oxide (such as lithium cobalt oxide), a polyanion (such as lithium iron phosphate) or a spinel (such as lithium manganese oxide). Recently, graphene based electrodes (based on 2D and 3D structures of graphene) have also been used as electrodes for lithium batteries. Pure lithium is highly reactive. It reacts vigorously with water to form lithium hydroxide (LiOH) and hydrogen gas. Thus, a non-aqueous electrolyte is typically used, and a sealed container rigidly excludes moisture from the battery pack. Lithium-ion batteries are more expensive than NiCd batteries but operate over a wider temperature range with higher energy densities. They require a protective circuit to limit peak voltage. Their design will minimize the risk of short circuits. Nissan Leaf's lithium-ion battery pack. The absence of a case gives pouch cells the highest gravimetric energy density; however, for many practical applications they still require an external means of containment to prevent expansion when their state-of-charge (SOC) level is high, and for general structural stability of the battery pack of which they are part. Both rigid plastic and pouch-style cells are sometimes referred to as prismatic cells due to their rectangular shapes. In 2014, Panasonic created the smallest Li-ion battery. It is pin shaped. It has a diameter of 3.5mm and a weight of 0.6g. 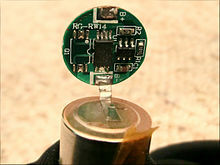 A coin cell form factor resembling that of ordinary lithium batteries is available since as early as 2006 for LiCoO2 cells, usually designated with a "LiR" prefix. The reactants in the electrochemical reactions in a lithium-ion battery are the negative and positive electrodes and the electrolyte providing a conductive medium for lithium ions to move between the electrodes. Electrical energy flows out from or in to the battery when electrons flow through an external circuit during discharge or charge, respectively.
" as below) to the positive electrode (cathode) (forming a lithium compound) through the electrolyte while the electrons flow through the external circuit in the same direction. When the cell is charging, the reverse occurs with the lithium ions and electrons move back into the negative electrode in a net higher energy state. The following equations exemplify the chemistry. during discharge. The cobalt electrode reaction is only reversible for x < 0.5 (x in mole units), limiting the depth of discharge allowable. This chemistry was used in the Li-ion cells developed by Sony in 1990. The cell's energy is equal to the voltage times the charge. Each gram of lithium represents Faraday's constant/6.941 or 13,901 coulombs. At 3 V, this gives 41.7 kJ per gram of lithium, or 11.6 kWh per kg. This is a bit more than the heat of combustion of gasoline, but does not consider the other materials that go into a lithium battery and that make lithium batteries many times heavier per unit of energy. The cell voltages given in the Electrochemistry section are larger than the potential at which aqueous solutions will electrolyze. 4 in an organic solvent, such as ethylene carbonate, dimethyl carbonate, and diethyl carbonate. A liquid electrolyte acts as a conductive pathway for the movement of cations passing from the negative to the positive electrodes during discharge. Typical conductivities of liquid electrolyte at room temperature (20 °C (68 °F)) are in the range of 10 mS/cm, increasing by approximately 30–40% at 40 °C (104 °F) and decreasing slightly at 0 °C (32 °F). The combination of linear and cyclic carbonates (e.g., ethylene carbonate (EC) and dimethyl carbonate (DMC)) offers high conductivity and solid electrolyte interphase (SEI)-forming ability. Organic solvents easily decompose on the negative electrodes during charge. When appropriate organic solvents are used as the electrolyte, the solvent decomposes on initial charging and forms a solid layer called the solid electrolyte interphase, which is electrically insulating yet provides significant ionic conductivity. The interphase prevents further decomposition of the electrolyte after the second charge. For example, ethylene carbonate is decomposed at a relatively high voltage, 0.7 V vs. lithium, and forms a dense and stable interface. It has been demonstrated that it is possible to form SEI in water-based batteries. Aqueous electrolytes with a very high concentration of a specific Lithium salt form a thin, protective layer of film on the anode electrode, which was previously thought to only occur in non-aqueous electrolytes. Composite electrolytes based on POE (poly(oxyethylene)) provide a relatively stable interface. It can be either solid (high molecular weight) and be applied in dry Li-polymer cells, or liquid (low molecular weight) and be applied in regular Li-ion cells. Room temperature ionic liquids (RTILs) are another approach to limiting the flammability and volatility of organic electrolytes. Recent advances in battery technology involve using a solid as the electrolyte material. The most promising of these are ceramics. Solid ceramic electrolytes are mostly lithium metal oxides which allow lithium ion transport through the solid more readily due to the intrinsic lithium. The main benefit of solid electrolytes is that there is no risk of leaks, which is a serious safety issue for batteries with liquid electrolytes. Solid ceramic electrolytes can be further broken down into two main categories: ceramic and glassy. Ceramic solid electrolytes are highly ordered compounds with crystal structures that usually have ion transport channels. Common ceramic electrolytes are lithium super ion conductors (LISICON) and perovskites. Glassy solid electrolytes are amorphous atomic structures made up of similar elements to ceramic solid electrolytes, but have higher conductivities overall due to higher conductivity at grain boundaries. Both glassy and ceramic electrolytes can be made more ionically conductive by substituting sulfur for oxygen. The larger radius of sulfur and its higher ability to be polarized allow for higher conductivity of lithium. This contributes to conductivities of solid electrolytes are nearing parity with their liquid counterparts, with most on the order of 0.1 mS/cm and the best at 10 mS/cm.
) carry the current within the battery from the negative to the positive electrode, through the non-aqueous electrolyte and separator diaphragm. During charging, an external electrical power source (the charging circuit) applies an over-voltage (a higher voltage than the battery produces, of the same polarity), forcing a charging current to flow within the battery from the positive to the negative electrode, i.e. in the reverse direction of a discharge current under normal conditions. The lithium ions then migrate from the positive to the negative electrode, where they become embedded in the porous electrode material in a process known as intercalation. Energy losses arising from electrical contact resistance at interfaces between electrode layers and at contacts with current-collectors can be as high as 20% of the entire energy flow of batteries under typical operating conditions . The charging procedures for single Li-ion cells, and complete Li-ion batteries, are slightly different. During the constant current phase, the charger applies a constant current to the battery at a steadily increasing voltage, until the voltage limit per cell is reached. During the balance phase, the charger reduces the charging current (or cycles the charging on and off to reduce the average current) while the state of charge of individual cells is brought to the same level by a balancing circuit, until the battery is balanced. Some fast chargers skip this stage. Some chargers accomplish the balance by charging each cell independently. During the constant voltage phase, the charger applies a voltage equal to the maximum cell voltage times the number of cells in series to the battery, as the current gradually declines towards 0, until the current is below a set threshold of about 3% of initial constant charge current. Periodic topping charge about once per 500 hours. Top charging is recommended to be initiated when voltage goes below 4.05 V/cell. Failure to follow current and voltage limitations can result in an explosion. Charging temperature limits for Li-ion are stricter than the operating limits. Lithium-ion chemistry performs well at elevated temperatures but prolonged exposure to heat reduces battery life. Consumer-grade lithium-ion batteries should not be charged at temperatures below 0 °C (32 °F). Although a battery pack may appear to be charging normally, electroplating of metallic lithium can occur at the negative electrode during a subfreezing charge, and may not be removable even by repeated cycling. Most devices equipped with Li-ion batteries do not allow charging outside of 0–45 °C for safety reasons, except for mobile phones that may allow some degree of charging when they detect an emergency call in progress. Because lithium-ion batteries can have a variety of positive and negative electrode materials, the energy density and voltage vary accordingly. The open circuit voltage is higher than aqueous batteries (such as lead acid, nickel-metal hydride and nickel-cadmium). [not in citation given] Internal resistance increases with both cycling and age. [not in citation given] Rising internal resistance causes the voltage at the terminals to drop under load, which reduces the maximum current draw. Eventually, increasing resistance will leave the battery in a state such that it can no longer support the normal discharge currents requested of it without unacceptable voltage drop or overheating. Batteries with a lithium iron phosphate positive and graphite negative electrodes have a nominal open-circuit voltage of 3.2 V and a typical charging voltage of 3.6 V. Lithium nickel manganese cobalt (NMC) oxide positives with graphite negatives have a 3.7 V nominal voltage with a 4.2 V maximum while charging. The charging procedure is performed at constant voltage with current-limiting circuitry (i.e., charging with constant current until a voltage of 4.2 V is reached in the cell and continuing with a constant voltage applied until the current drops close to zero). Typically, the charge is terminated at 3% of the initial charge current. In the past, lithium-ion batteries could not be fast-charged and needed at least two hours to fully charge. Current-generation cells can be fully charged in 45 minutes or less. In 2015 researchers demonstrated a small 600 mAh capacity battery charged to 68 percent capacity in two minutes and a 3,000 mAh battery charged to 48 percent capacity in five minutes. The latter battery has an energy density of 620 W·h/L. The device employed heteroatoms bonded to graphite molecules in the anode. Performance of manufactured batteries has improved over time. For example, from 1991 to 2005 the energy capacity per price of lithium ion batteries improved more than ten-fold, from 0.3 W·h per dollar to over 3 W·h per dollar. In the period from 2011-2017, progress has averaged 7.5% annually. The increasing demand for batteries has led vendors and academics to focus on improving the energy density, operating temperature, safety, durability, charging time, output power, and cost of lithium ion battery technology. The following materials have been used in commercially available cells. Research into other materials continues. 4. The cobalt-based material develops a pseudo tetrahedral structure that allows for two-dimensional lithium ion diffusion. The cobalt-based cathodes are ideal due to their high theoretical specific heat capacity, high volumetric capacity, low self-discharge, high discharge voltage, and good cycling performance. Limitations include the high cost of the material, and low thermal stability. The manganese-based materials adopt a cubic crystal lattice system, which allows for three-dimensional lithium ion diffusion. Manganese cathodes are attractive because manganese is cheaper and because it could theoretically be used to make a more efficient, longer-lasting battery if its limitations could be overcome. Limitations include the tendency for manganese to dissolve into the electrolyte during cycling leading to poor cycling stability for the cathode. Cobalt-based cathodes are the most common, however other materials are being researched with the goal of lowering costs and improving battery life. 4 is a candidate for large-scale production of lithium-ion batteries such as electric vehicle applications due to its low cost, excellent safety, and high cycle durability. For example, Sony Fortelion batteries have retained 74% of their capacity after 8000 cycles with 100% discharge. A carbon conductive agent is required to overcome its low electrical conductivity. Electrolyte alternatives have also played a significant role, for example the lithium polymer battery. Negative electrode materials are traditionally constructed from graphite and other carbon materials, although newer silicon based materials are being increasingly used (see Nanowire battery). These materials are used because they are abundant and are electrically conducting and can intercalate lithium ions to store electrical charge with modest volume expansion (ca. 10%). The reason that graphite is the dominant material is because of its low voltage and excellent performance. Various materials have been introduced but their voltage is high leading to a low energy density. Low voltage of material is the key requirement; otherwise, the excess capacity is useless in terms of energy density. Graphite Targray The dominant negative electrode material used in lithium ion batteries. 1991 Low cost and good energy density. Graphite anodes can accommodate one lithium atom for every six carbon atoms. Charging rate is governed by the shape of the long, thin graphene sheets. While charging, the lithium ions must travel to the outer edges of the graphene sheet before coming to rest (intercalating) between the sheets. The circuitous route takes so long that they encounter congestion around those edges. Silicon/Carbon Volumetric: 580 W·h/l Amprius Smartphones, providing 5000 mA·h capacity 2013 Uses < 10wt% Silicon nanowires combined with graphite and binders. Energy density: ~74 mAh/g. Another approach used carbon-coated 15 nm thick crystal silicon flakes. The tested half-cell achieved 1.2 Ah/g over 800 cycles. The extensive 2007 Review Article by Kasavajjula et al. summarizes early research on silicon-based anodes for lithium-ion secondary cells. In particular, Hong Li et al  showed in 2000 that the electrochemical insertion of lithium ions in silicon nanoparticles and silicon nanowires leads to the formation of an amorphous Li-Si alloy. The same year, Bo Gao and his doctoral advisor, Professor Otto Zhou described the cycling of electrochemical cells with anodes comprising silicon nanowires, with a reversible capacity ranging from at least approximately 900 to 1500 mAh/g. , and degrade the capacity and cycling stability of the anode. )-insertion/removal without significant cracking. Yet the formation of SEI on Si still occurs. So a coating would be logical, in order to account for any increase in the volume of the Si, a tight surface coating is not viable. In 2012 researchers from Northwestern University created an approach to encapsulate Si nanoparticles using crumpled r-GO, graphene oxide. This method allows for protection of the Si nanoparticles from the electrolyte as well as allow for the expansion of Si without expansion due to the wrinkles and creases in the graphene balls. for current densities 0.2 to 4 A/g, delivering 1200 mAh/g at 0.2 A/g. Polymer electrolytes are promising for minimizing the dendrite formation of lithium. Polymers are supposed to prevent short circuits and maintain conductivity. 6 electrolyte. The value for ε, the porosity of the electrolyte, is 0.724. Portable devices: these include mobile phones and smartphones, laptops and tablets, digital cameras and camcorders, electronic cigarettes, handheld game consoles and torches (flashlights). Power tools: Li-ion batteries are used in tools such as cordless drills, sanders, saws, and a variety of garden equipment including whipper-snippers and hedge trimmers. Electric vehicles: electric vehicle batteries are used in electric cars, hybrid vehicles, electric motorcycles and scooters, electric bicycles, personal transporters and advanced electric wheelchairs. Also radio-controlled models, model aircraft, aircraft, and the Mars Curiosity rover. Li-ion batteries are used in telecommunications applications. Secondary non-aqueous lithium batteries provide reliable backup power to load equipment located in a network environment of a typical telecommunications service provider. Li-ion batteries compliant with specific technical criteria are recommended for deployment in the Outside Plant (OSP) at locations such as Controlled Environmental Vaults (CEVs), Electronic Equipment Enclosures (EEEs), and huts, and in uncontrolled structures such as cabinets. In such applications, li-ion battery users require detailed, battery-specific hazardous material information, plus appropriate fire-fighting procedures, to meet regulatory requirements and to protect employees and surrounding equipment. Batteries gradually self-discharge even if not connected and delivering current. Li+ rechargeable batteries have a self-discharge rate typically stated by manufacturers to be 1.5-2% per month. The rate increases with temperature and state of charge. A 2004 study found that for most cycling conditions self-discharge was primarily time-dependent; however, after several months of stand on open circuit or float charge, state-of-charge dependent losses became significant. The self-discharge rate did not increase monotonically with state-of-charge, but dropped somewhat at intermediate states of charge. Self-discharge rates may increase as batteries age. In 1999, self-discharge per month was measured at 8% at 21 °C, 15% at 40 °C, 31% at 60 °C. By 2007, monthly self-discharge rate was estimated at 2% to 3%, and 2-3% by 2016. By comparison, the self-discharge rate for metal hydride (NiMH) batteries dropped, as of 2017, from up to 30% per month for previously common cells to about 0.08% - 0.33% per month for low self-discharge NiMH batteries, and is about 10% per month in nickel-cadmium batteries. Rechargeable battery life is typically defined as the number of full charge-discharge cycles before significant capacity loss. Inactive storage may also reduce capacity. Manufacturers' information typically specify lifespan in terms of the number of cycles (e.g., capacity dropping linearly to 80% over 500 cycles), with no mention of chronological age. On average, lifetimes consist of 1000 cycles, although battery performance is rarely specified for more than 500 cycles. This means that batteries of mobile phones, or other hand-held devices in daily use, are not expected to last longer than three years. Some batteries based on carbon anodes offer more than 10,000 cycles. As a battery discharges, its voltage gradually diminishes. When depleted below the protection circuit's low-voltage threshold (2.4 to 2.9 V/cell, depending on chemistry) the circuit disconnects and stops discharging until recharged. As discharge progresses, metallic cell contents plate onto its internal structure, creating an unwanted discharge path. Defining battery life via full discharge cycles, is the industry standard, but may be biased, since full depth of discharge (DoD)/recharge may itself diminish battery life, compared to cumulative Ah partial discharge/charge performance. Projection from the standard to specific use patterns may require additional factors, e.g. DoD, rate of discharge, temperature, etc. Multiplying the battery life (in cycles, at rated cycle depth) by the rated capacity (in Ah) and by the rated nominal Voltage gives the total energy delivered over the life of the battery. From this one can calculate the cost per kWh of the energy (including the cost of charging). A 2015 study by Andreas Gutsch of the Karlsruhe Institute of Technology found that lithium-ion battery lifespan could vary by a factor of five, with some Li-ion cells losing 30% of their capacity after 1,000 cycles, and others having better capacity after 5,000 cycles. The study also found that safety standards for some batteries were not met. For stationary energy storage it was estimated that batteries with lifespans of at least 3,000 cycles were needed for profitable operation. Over their lifespan, batteries degrade progressively with reduced capacity, cycle life, and safety due to chemical changes to the electrodes. Capacity loss/fade is expressed as a percentage of initial capacity after a number of cycles (e.g., 30% loss after 1,000 cycles). Fade can be separated into calendar loss and cycling loss. Calendar loss results from the passage of time and is measured from the maximum state of charge. Cycling loss is due to usage and depends on both the maximum state of charge and the depth of discharge. Increased rate of self-discharge can be an indicator of internal short-circuit. The advent of the SEI layer improved performance, but increased vulnerability to thermal degradation. The layer is composed of electrolyte – carbonate reduction products that serve both as an ionic conductor and electronic insulator. It forms on both the anode and cathode and determines many performance parameters. Under typical conditions, such as room temperature and the absence of charge effects and contaminants, the layer reaches a fixed thickness after the first charge, allowing the device to operate for years. However, operation outside such parameters can degrade the device via several reactions. Lithium-ion batteries are prone to capacity fading over thousands of cycles. It is by slow electrochemical processes, the formation of a solid-electrolyte inter phase (SEI) in the negative electrode. SEI forms in between the first charge and discharge and results in the consumption of lithium ions. The consumption of lithium ions reduces the charge and discharge efficiency of the electrode material. However, SEI film is organic solvent insoluble and hence it can be stable in organic electrolyte solutions. If proper additives are added to the electrolyte to promote SEI formation, the co-embedding of solvent molecules can be effectively prevented and the damage to electrode materials can be avoided. On the other hand, SEI is selective and allows lithium ions to pass through and forbids electrons to pass through. This guarantees the continuity of charging and discharging cycle. SEI hinders the further consumption of lithium ions and thus greatly improves the electrode, as well as the cycle performance and service life. Chemical reduction of the electrolyte by the anode. Thermal decomposition of the electrolyte. Chemical oxidation of the electrolyte by the cathode. Thermal decomposition by the cathode and anode. Internal short circuit by charge effects. The SEI layer that forms on the anode is a mixture of lithium oxide, lithium fluoride and semicarbonates (e.g., lithium alkyl carbonates). 3 that increases film thickness, limiting anode efficiency. This increases cell impedance and reduces capacity. Gases formed by electrolyte decomposition can increase the cell's internal pressure and are a potential safety issue in demanding environments such as mobile devices. Below 25 °C, plating of metallic Lithium on the anodes and subsequent reaction with the electrolyte is leading to loss of cyclable Lithium. Extended storage can trigger an incremental increase in film thickness and capacity loss. Charging at greater than 4.2 V can initiate Li+ plating on the anode, producing irreversible capacity loss. The randomness of the metallic lithium embedded in the anode during intercalation results in dendrites formation. Over time the dendrites can accumulate and pierce the separator, causing a short circuit leading to heat, fire or explosion. This process is referred to as thermal runaway. Discharging beyond 2 V can also result in capacity loss. The (copper) anode current collector can dissolve into the electrolyte. When charged, copper ions can reduce on the anode as metallic copper. Over time, copper dendrites can form and cause a short in the same manner as lithium. High cycling rates and state of charge induces mechanical strain on the anode's graphite lattice. Mechanical strain caused by intercalation and de-intercalation creates fissures and splits of the graphite particles, changing their orientation. This orientation change results in capacity loss. Electrolyte degradation mechanisms include hydrolysis and thermal decomposition. 5. Under typical conditions, the equilibrium lies far to the left. However the presence of water generates substantial LiF, an insoluble, electrically insulating product. LiF binds to the anode surface, increasing film thickness. 5 reacts with water to form hydrofluoric acid (HF) and phosphorus oxyfluoride. Phosphorus oxyfluoride in turn reacts to form additional HF and difluorohydroxy phosphoric acid. HF converts the rigid SEI film into a fragile one. On the cathode, the carbonate solvent can then diffuse onto the cathode oxide over time, releasing heat and thermal runaway. Decomposition of electrolyte salts and interactions between the salts and solvent start at as low as 70 C. Significant decomposition occurs at higher temperatures. At 85 C transesterification products, such as dimethyl-2,5-dioxahexane carboxylate (DMDOHC) are formed from EC reacting with DMC. Cathode degradation mechanisms include manganese dissolution, electrolyte oxidation and structural disorder. Material loss of the spinel results in capacity fade. Temperatures as low as 50 °C initiate Mn2+ deposition on the anode as metallic manganese with the same effects as lithium and copper plating. Cycling over the theoretical max and min voltage plateaus destroys the crystal lattice via Jahn-Teller distortion, which occurs when Mn4+ is reduced to Mn3+ during discharge. Storage of a battery charged to greater than 3.6 V initiates electrolyte oxidation by the cathode and induces SEI layer formation on the cathode. As with the anode, excessive SEI formation forms an insulator resulting in capacity fade and uneven current distribution. 4 cathodes, the release of oxygen and irreversible capacity loss. The need to "condition" NiCd and NiMH batteries has leaked into folklore surrounding Li-ion batteries, but is unfounded. The recommendation for the older technologies is to leave the device plugged in for seven or eight hours, even if fully charged. This may be a confusion of battery software calibration instructions with the "conditioning" instructions for NiCd and NiMH batteries. Li-ion batteries require a battery management system to prevent operation outside each cell's safe operating area (max-charge, min-charge, safe temperature range) and to balance cells to eliminate state of charge mismatches. This significantly improves battery efficiency and increases capacity. As the number of cells and load currents increase, the potential for mismatch increases. The two kinds of mismatch are state-of-charge (SOC) and capacity/energy ("C/E"). Though SOC is more common, each problem limits pack charge capacity (mA·h) to that of the weakest cell. If overheated or overcharged, Li-ion batteries may suffer thermal runaway and cell rupture. In extreme cases this can lead to leakage, explosion or fire. To reduce these risks, many lithium-ion cells (and battery packs) contain fail-safe circuitry that disconnects the battery when its voltage is outside the safe range of 3–4.2 V per cell. or when overcharged or discharged. Lithium battery packs, whether constructed by a vendor or the end-user, without effective battery management circuits are susceptible to these issues. Poorly designed or implemented battery management circuits also may cause problems; it is difficult to be certain that any particular battery management circuitry is properly implemented. Lithium-ion cells are susceptible to damage outside the allowed voltage range that is typically 2.5 to 3.65/4.1/4.2 or 4.35V (depending on the chemistry used and design of the cell). Exceeding this voltage range results in premature aging of the cells and, furthermore, results in safety risks due to the reactive components in the cells. When stored for long periods the small current draw of the protection circuitry may drain the battery below its shutoff voltage; normal chargers may then be useless since the BMS may retain a record of this battery (or charger) 'failure'. Many types of lithium-ion cells cannot be charged safely below 0 °C. These features are required because the negative electrode produces heat during use, while the positive electrode may produce oxygen. However, these additional devices occupy space inside the cells, add points of failure, and may irreversibly disable the cell when activated. Further, these features increase costs compared to nickel metal hydride batteries, which require only a hydrogen/oxygen recombination device and a back-up pressure valve. Contaminants inside the cells can defeat these safety devices. Also, these features can not be applied to all kinds of cells, e.g. prismatic high current cells cannot be equipped with a vent or thermal interrupt. High current cells must not produce excessive heat or oxygen, lest there be a failure, possibly violent. Instead, they must be equipped with internal thermal fuses which act before the anode and cathode reach their thermal limits. Replacing the lithium cobalt oxide positive electrode material in lithium-ion batteries with a lithium metal phosphate such as lithium iron phosphate (LFP) improves cycle counts, shelf life and safety, but lowers capacity. As of 2006 these 'safer' lithium-ion batteries were mainly used in electric cars and other large-capacity battery applications, where safety is critical. Lithium-ion batteries, unlike rechargeable batteries with water-based electrolytes, have a potentially hazardous pressurised flammable liquid electrolyte, and require strict quality control during manufacture. A faulty battery can cause a serious fire. Faulty chargers can affect the safety of the battery because they can destroy the battery's protection circuit. While charging at temperatures below 0 °C, the negative electrode of the cells gets plated with pure lithium, which can compromise the safety of the whole pack. While fire is often serious, it may be catastrophically so. In about 2010 large lithium-ion batteries were introduced in place of other chemistries to power systems on some aircraft; as of January 2014[update] there had been at least four serious lithium-ion battery fires, or smoke, on the Boeing 787 passenger aircraft, introduced in 2011, which did not cause crashes but had the potential to do so. In addition, several aircraft crashes have been attributed to burning Li-Ion batteries. UPS Airlines Flight 6 crashed in Dubai after its payload of batteries spontaneously ignited, progressively destroying critical systems inside the aircraft which eventually rendered it uncontrollable. Since Li-ion batteries contain less of toxic metals than other types of batteries which may contain lead or cadmium, they are generally categorized as non-hazardous waste. Li-ion battery elements including iron, copper, nickel and cobalt are considered safe for incinerators and landfills. These metals can be recycled, but mining generally remains cheaper than recycling. At present, not much is invested into recycling Li-ion batteries due to cost, complexity and low yield. The most expensive metal involved in the construction of the cell is cobalt, much of which is mined in Congo. Lithium iron phosphate is cheaper but has other drawbacks. Lithium is less expensive than other metals used, but recycling could prevent a future shortage. The manufacturing processes of nickel and cobalt, and the solvent, present potential environmental and health hazards. Manufacturing a kg of Li-ion battery takes energy equivalent to 1.6 kg of oil. In October 2004 Kyocera Wireless recalled approximately 1 million mobile phone batteries to identify counterfeits. In December 2005 Dell recalled approximately 22,000 laptop computer batteries, and 4.1 million in August 2006. In 2006 approximately 10 million Sony batteries used in Dell, Sony, Apple, Lenovo, Panasonic, Toshiba, Hitachi, Fujitsu and Sharp laptops were recalled. The batteries were found to be susceptible to internal contamination by metal particles during manufacture. Under some circumstances, these particles could pierce the separator, causing a dangerous short-circuit. In March 2007 computer manufacturer Lenovo recalled approximately 205,000 batteries at risk of explosion. In August 2007 mobile phone manufacturer Nokia recalled over 46 million batteries at risk of overheating and exploding. One such incident occurred in the Philippines involving a Nokia N91, which used the BL-5C battery. In September 2016 Samsung recalled approximately 2.5 million Galaxy Note 7 phones after 35 confirmed fires. The recall was due to a manufacturing design fault in Samsung's batteries which caused internal positive and negative poles to touch. IATA estimates that over a billion lithium cells are flown each year. The maximum size of each battery (whether installed in a device or as spare batteries) that can be carried is one that has an equivalent lithium content (ELC) not exceeding 8 grammes per battery. Except, that if only one or two batteries are carried, each may have an ELC of up to 25 g. The ELC for any battery is found by multiplying the ampere-hour capacity of each cell by 0.3 and then multiplying the result by the number of cells in the battery. The resultant calculated lithium content is not the actual lithium content but a theoretical figure solely for transportation purposes. When shipping lithium ion batteries however, if the total lithium content in the cell exceeds 1.5 g, the package must be marked as "Class 9 miscellaneous hazardous material". Although devices containing lithium-ion batteries may be transported in checked baggage, spare batteries may be only transported in carry-on baggage. They must be protected against short circuiting, and example tips are provided in the transport regulations on safe packaging and carriage; e.g., such batteries should be in their original protective packaging or, "by taping over the exposed terminals or placing each battery in a separate plastic bag or protective pouch". These restriction do not apply to a lithium-ion battery that is a part of a wheelchair or mobility aid (including any spare batteries) to which a separate set of rules and regulations apply. Some postal administrations restrict air shipping (including EMS) of lithium and lithium-ion batteries, either separately or installed in equipment. Such restrictions apply in Hong Kong, Australia and Japan. Other postal administrations, such as the United Kingdom's Royal Mail may permit limited carriage of batteries or cells that are operative but totally prohibit handling of known defective ones, which is likely to prove of significance to those discovering faulty such items bought through mail-order channels. IATA provides details in its Lithium Battery Guidance document. On 16 May 2012, the United States Postal Service (USPS) banned shipping anything containing a lithium battery to an overseas address, after fires from transport of batteries. This restriction made it difficult to send anything containing lithium batteries to military personnel overseas, as the USPS was the only method of shipment to these addresses; the ban was lifted on 15 November 2012. United Airlines and Delta Air Lines excluded lithium-ion batteries in 2015 after an FAA report on chain reactions. Starting on 15 January 2018, several major U.S. airlines banned smart luggage with non-removable batteries from being checked in to travel in the cargo hold due to the risk of fire. Some airlines continued to mistakenly prevent passengers from bringing smart luggage as a carry on after the ban went into effect. Several smart luggage companies have been forced to shut down as a result of the ban. Researchers are actively working to improve the power density, safety, cycle durability (battery life), recharge time, cost, flexibility, and other characteristics, as well as research methods and uses, of these batteries. ^ a b c "Rechargeable Li-Ion OEM Battery Products". Panasonic.com. Archived from the original on 13 April 2010. Retrieved 23 April 2010. ^ a b "Panasonic Develops New Higher-Capacity 18650 Li-Ion Cells; Application of Silicon-based Alloy in Anode". greencarcongress.com. Retrieved 31 January 2011. ^ "NCR18650B" (PDF). Panasonic. Retrieved 7 October 2016. ^ "NCR18650GA" (PDF). Retrieved 2 July 2017. ^ Claire Curry (5 July 2017). "Lithium Ion Battery Costs and Market" (PDF). Bloomberg New Energy Finance. Retrieved 21 October 2018. ^ a b Redondo-Iglesias, Eduardo; Venet, Pascal; Pelissier, Serge (2016). "Measuring Reversible and Irreversible Capacity Losses on Lithium-Ion Batteries". 2016 IEEE Vehicle Power and Propulsion Conference (VPPC). p. 7. doi:10.1109/VPPC.2016.7791723. ISBN 978-1-5090-3528-1. ^ Battery Types and Characteristics for HEV Archived 20 May 2015 at the Wayback Machine ThermoAnalytics, Inc., 2007. Retrieved 11 June 2010. ^ "Memory effect now also found in lithium-ion batteries". Retrieved 5 August 2015. ^ Ballon, Massie Santos (14 October 2008). "Electrovaya, Tata Motors to make electric Indica". cleantech.com. Archived from the original on 9 May 2011. Retrieved 11 June 2010. ^ Mauger, A; Julien, C.M. (28 June 2017). "Critical review on lithium-ion batteries: are they safe? Sustainable?". Ionics. 23 (8): 1933–1947. doi:10.1007/s11581-017-2177-8. ^ a b Hislop, Martin (1 March 2017). "Solid-state EV battery breakthrough from Li-ion battery inventor John Goodenough". North American Energy News. The American Energy News. Retrieved 15 March 2017. ^ a b c Schweber, Bill (4 August 2015). "Lithium Batteries: The Pros and Cons". GlobalSpec. GlobalSpec. Retrieved 15 March 2017. ^ a b IEC 62133. Secondary cells and batteries containing alkaline or other non-acid electrolytes – Safety requirements for portable sealed secondary cells, and for batteries made from them, for use in portable applications (2.0 ed.). International Electrotechnical Commission. December 2012. ISBN 978-2-83220-505-1. ^ a b "Samsung recall for Galaxy Note 7". news.com.au. 2 September 2016. Archived from the original on 2 September 2016. ^ Chen, Mingyi; Liu, Jiahao; He, Yaping; Yuen, Richard; Wang, Jian (October 2017). "Study of the fire hazards of lithium-ion batteries at different pressures". Applied Thermal Engineering. 125: 1061–1074. doi:10.1016/j.applthermaleng.2017.06.131. ISSN 1359-4311. ^ Eftekhari, Ali (2017). "Lithium-Ion Batteries with High Rate Capabilities". ACS Sustainable Chemistry & Engineering. 5 (3): 2799–2816. doi:10.1021/acssuschemeng.7b00046. ^ Hopkins, Gina (16 November 2017). "Watch: Cuts and dunks don't stop new lithium-ion battery - Futurity". Futurity. Retrieved 10 July 2018. ^ IEC 61960. Secondary cells and batteries containing alkaline or other non-acid electrolytes – Secondary lithium cells and batteries for portable applications (2.0 ed.). International Electrotechnical Commission. June 2011. ISBN 978-2-88912-538-8. ^ ISO 12405-1:2011. Electrically propelled road vehicles — Test specification for lithium-ion traction battery packs and systems. Part 1: High-power applications. International Organization for Standardization. 2011. ISBN 978-0-580-62648-7. ^ Doughty, Daniel H.; Crafts, Chris C. (August 2006). SAND 2005–3123. FreedomCAR Electrical Energy Storage System Abuse Test Manual for Electric and Hybrid Electric Vehicle Applications. Sandia National Laboratories. ^ Whittingham, M. S. (1976). "Electrical Energy Storage and Intercalation Chemistry". Science. 192 (4244): 1126–1127. Bibcode:1976Sci...192.1126W. doi:10.1126/science.192.4244.1126. PMID 17748676. ^ "XXIV.—On chemical analysis by spectrum-observations". Quarterly Journal of the Chemical Society of London. 13 (3): 270. 1861. doi:10.1039/QJ8611300270. ^ Besenhard, J.O. & Fritz, H.P. (1974). "Cathodic Reduction of Graphite in Organic Solutions of Alkali and NR4+ Salts". J. Electroanal. Chem. 53 (2): 329–333. doi:10.1016/S0022-0728(74)80146-4. ^ Besenhard, J. O. (1976). "The electrochemical preparation and properties of ionic alkali metal-and NR4-graphite intercalation compounds in organic electrolytes". Carbon. 14 (2): 111–115. doi:10.1016/0008-6223(76)90119-6. ^ Schöllhorn, R.; Kuhlmann, R.; Besenhard, J. O. (1976). "Topotactic redox reactions and ion exchange of layered MoO3 bronzes". Materials Research Bulletin. 11: 83–90. doi:10.1016/0025-5408(76)90218-X. ^ Besenhard, J. O.; Schöllhorn, R. (1976). "The discharge reaction mechanism of the MoO3 electrode in organic electrolytes". Journal of Power Sources. 1 (3): 267–276. Bibcode:1976JPS.....1..267B. doi:10.1016/0378-7753(76)81004-X. ^ Besenhard, J. O.; Eichinger, G. (1976). "High energy density lithium cells". Journal of Electroanalytical Chemistry and Interfacial Electrochemistry. 68: 1–18. doi:10.1016/S0022-0728(76)80298-7. ^ Eichinger, G.; Besenhard, J. O. (1976). "High energy density lithium cells". Journal of Electroanalytical Chemistry and Interfacial Electrochemistry. 72: 1–31. doi:10.1016/S0022-0728(76)80072-1. ^ Heller, Adam (25 November 1975). "Electrochemical Cell". United States Patent. Retrieved 18 November 2013. ^ Zanini, M.; Basu, S.; Fischer, J. E. (1978). "Alternate synthesis and reflectivity spectrum of stage 1 lithium—graphite intercalation compound". Carbon. 16 (3): 211–212. doi:10.1016/0008-6223(78)90026-X. ^ Basu, S.; Zeller, C.; Flanders, P. J.; Fuerst, C. D.; Johnson, W. D.; Fischer, J. E. (1979). "Synthesis and properties of lithium-graphite intercalation compounds". Materials Science and Engineering. 38 (3): 275–283. doi:10.1016/0025-5416(79)90132-0. ^ Godshall, N.A. ; Raistrick, I.D. ; Huggins, R.A. (1980). "Thermodynamic investigations of ternary lithium-transition metal-oxygen cathode materials". Materials Research Bulletin. 15 (5): 561. doi:10.1016/0025-5408(80)90135-X. ^ Godshall, Ned A. (17 October 1979) "Electrochemical and Thermodynamic Investigation of Ternary Lithium -Transition Metal-Oxide Cathode Materials for Lithium Batteries: Li2MnO4 spinel, LiCoO2, and LiFeO2", Presentation at 156th Meeting of the Electrochemical Society, Los Angeles, CA. ^ "USPTO search for inventions by "Goodenough, John"". Patft.uspto.gov. Retrieved 8 October 2011. 2(0<x<-1): A new cathode material for batteries of high energy density". Materials Research Bulletin. 15 (6): 783–789. doi:10.1016/0025-5408(80)90012-4. ^ Qi, Zhaoxiang; Koenig, Gary M. (16 August 2016). "High-Performance LiCoO2Sub-Micrometer Materials from Scalable Microparticle Template Processing". ChemistrySelect. 1 (13): 3992–3999. doi:10.1002/slct.201600872. ^ a b Godshall, N (1986). "Lithium transport in ternary lithium-copper-oxygen cathode materials". Solid State Ionics. 18–19: 788–793. doi:10.1016/0167-2738(86)90263-8. ^ Yazami, R.; Touzain, P. (1983). "A reversible graphite-lithium negative electrode for electrochemical generators". Journal of Power Sources. 9 (3): 365–371. Bibcode:1983JPS.....9..365Y. doi:10.1016/0378-7753(83)87040-2. ^ Godshall, N. A.; Raistrick, I. D. and Huggins, R. A. U.S. Patent 4,340,652 "Ternary Compound Electrode for Lithium Cells"; issued 20 July 1982, filed by Stanford University on 30 July 1980. ^ Thackeray, M. M.; David, W. I. F.; Bruce, P. G.; Goodenough, J. B. (1983). "Lithium insertion into manganese spinels". Materials Research Bulletin. 18 (4): 461–472. doi:10.1016/0025-5408(83)90138-1. ^ Nazri, Gholamabbas & Pistoia, Gianfranco (2004). Lithium batteries: science and Technology. Springer. ISBN 978-1402076282. ^ a b Voelcker, John (September 2007). Lithium Batteries Take to the Road Archived 27 May 2009 at the Wayback Machine. IEEE Spectrum. Retrieved 15 June 2010. ^ Manthiram, A.; Goodenough, J. B. (1989). "Lithium insertion into Fe2(SO4)3 frameworks". Journal of Power Sources. 26 (3–4): 403–408. Bibcode:1989JPS....26..403M. doi:10.1016/0378-7753(89)80153-3. ^ Armand, M.; Touzain, P. (1977). "Graphite intercalation compounds as cathode materials". Material Science and Engineering. 31: 319–329. doi:10.1016/0025-5416(77)90052-0. ^ Novák, P.; Muller, K.; Santhanam, K. S. V.; Haas, O. (1997). "Electrochemically Active Polymers for Rechargeable Batteries". Chem. Rev. 97 (1): 207–281. doi:10.1021/cr941181o. ^ Yamabe, T. (2015). "Lichiumu Ion Niji Denchi: Kenkyu Kaihatu No Genryu Wo Kataru" [Lithium Ion Rechargeable Batteries: Tracing the Origins of Research and Development: Focus on the History of Negative-Electrode Material Development]. The Journal Kagaku (in Japanese). 70 (12): 40–46. Archived from the original on 8 August 2016. Retrieved 15 June 2016. ^ Novák, P.; Muller, K.; Santhanam, K. S. V.; Haas, O. (1997). "Electrochemically Active Polymers for Rechargeable Batteries". Chem. Rev. 97 (1): 271–272. doi:10.1021/cr941181o. ^ Yamabe, T.; Tanaka, K.; Ohzeki, K.; Yata, S. (1982). "Electronic Structure of Polyacenacene. A One-Dimensional Graphite". Solid State Communications. 44 (6): 823. Bibcode:1982SSCom..44..823Y. doi:10.1016/0038-1098(82)90282-4. ^ ‹See Tfd›US 4601849, ‹See Tfd›Yata, S., "Electrically conductive organic polymeric material and process for production thereof"
^ Nigrey, Paul J (1981). "Lightweight Rechargeable Storage Batteries Using Polyacetylene (CH)x as the Cathode-Active Material". Chem. Rev. 128 (8): 1651. doi:10.1149/1.2127704. ^ a b "Keywords to understanding Sony Energy Devices – keyword 1991". Archived from the original on 4 March 2016. ^ ‹See Tfd›US US6964828 B2, ‹See Tfd›Lu, Zhonghua, "Cathode compositions for lithium-ion batteries"
^ a b "In search of the perfect battery" (PDF). The Economist. 6 March 2008. Archived from the original (PDF) on 27 July 2011. Retrieved 11 May 2010. ^ "At long last, new lithium battery tech actually arrives on the market (and might already be in your smartphone)". ExtremeTech. Retrieved 16 February 2014. ^ "Switching From Lithium-Ion Could Be Harder Than You Think". 19 October 2017. Retrieved 20 October 2017. ^ Fisher, Thomas. "Will Tesla Alone Double Global Demand For Its Battery Cells? (Page 2)". Greencarreports.com. Retrieved 16 February 2014. ^ "Reduced cell cost suggests the upcoming era of large capacity cells". EnergyTrend. 6 May 2013. Retrieved 16 February 2014. ^ Ramsey, Mike (22 June 2015). "24M Technologies Launches Cheaper-to-Produce Lithium-Ion Cell". Retrieved 15 December 2015. ^ "Chevy Bolt EV: LG gearing up to 'mass-produce parts' for the car this month". 8 August 2016. Retrieved 2 August 2017. ^ a b "INDIRECT PURCHASER PLAINTIFFS' THIRD CONSOLIDATED AMENDED CLASS ACTION COMPLAINT" (PDF). batteriesconsumerlitigation.com. Archived from the original (PDF) on 24 September 2016. ^ "SETTLEMENT AGREEMENT" (PDF). batteriesconsumerlitigation.com. Archived from the original (PDF) on 24 September 2016. ^ Silberberg, M. (2006). Chemistry: The Molecular Nature of Matter and Change, 4th Ed. New York (NY): McGraw-Hill Education. p. 935, ISBN 0077216504. ^ Thackeray, M. M.; Thomas, J. O.; Whittingham, M. S. (2011). "Science and Applications of Mixed Conductors for Lithium Batteries". MRS Bulletin. 25 (3): 39–46. doi:10.1557/mrs2000.17. ^ Shehzad, Khurram; Xu, Yang; Gao, Chao; Xianfeng, Duan (2016). "Three-dimensional macro-structures of two-dimensional nanomaterials". Chemical Society Reviews. 45 (20): 5541–5588. doi:10.1039/C6CS00218H. PMID 27459895. ^ MSDS: National Power Corp Lithium Ion Batteries Archived 26 June 2011 at the Wayback Machine (PDF). tek.com; Tektronix Inc., 7 May 2004. Retrieved 11 June 2010. ^ Goodwins, Rupert (17 August 2006). "Inside a notebook battery pack". ZDNet. Retrieved 6 June 2013. ^ Andrea 2010, p. 2. ^ Andrea 2010, p. 234. ^ Wang, Y.; He, P.; Zhou, H. (2012). "Li-Redox Flow Batteries Based on Hybrid Electrolytes: At the Cross Road between Li-ion and Redox Flow Batteries". Advanced Energy Materials. 2 (7): 770–779. doi:10.1002/aenm.201200100. ^ Qi, Zhaoxiang; Koenig, Gary M. (15 August 2016). "A carbon-free lithium-ion solid dispersion redox couple with low viscosity for redox flow batteries". Journal of Power Sources. 323: 97–106. doi:10.1016/j.jpowsour.2016.05.033. ^ Erol, Salim (5 January 2015). "Electrochemical Impedance Spectroscopy Analysis and Modeling of Lithium Cobalt Oxide/Carbon Batteries". Retrieved 10 September 2018. ^ "Rechargeable Li-Ion Button Battery: Serial LIR2032" (PDF). AA Portable Power Corp.
^ Qi, Zhaoxiang; Koenig, Gary M. (2017). "Review Article: Flow battery systems with solid electroactive materials". Journal of Vacuum Science & Technology B, Nanotechnology and Microelectronics: Materials, Processing, Measurement, and Phenomena. 35 (4): 040801. doi:10.1116/1.4983210. ^ Guyomard, Dominique; Tarascon, Jean-Marie (1994). "Rocking-chair or lithium-ion rechargeable lithium batteries". Advanced Materials. 6 (5): 408–412. doi:10.1002/adma.19940060516. ISSN 1521-4095. ^ Megahed, Sid; Scrosati, Bruno. "Lithium-ion rechargeable batteries". www.sciencedirect.com. pp. 79–104. doi:10.1016/0378-7753(94)01956-8. Retrieved 27 March 2019. ^ Brain, Marshall (14 November 2006). "How Lithium-ion Batteries Work". HowStuffWorks. Retrieved 20 March 2017. ^ Bergveld, H. J.; Kruijt, W. S.; Notten, P. H. L. (2002). Battery Management Systems: Design by Modelling. Springer. pp. 107–108, 113. ISBN 978-94-017-0843-2. ^ Dhameja, S (2001). Electric Vehicle Battery Systems. Newnes Press. p. 12. ISBN 978-075-06991-67. ^ Choi, H. C.; Jung, Y. M.; Noda, I.; Kim, S. B. (2003). "A Study of the Mechanism of the Electrochemical Reaction of Lithium with CoO by Two-Dimensional Soft X-ray Absorption Spectroscopy (2D XAS), 2D Raman, and 2D Heterospectral XAS−Raman Correlation Analysis". The Journal of Physical Chemistry B. 107 (24): 5806–5811. doi:10.1021/jp030438w. 2 Solid Solution". Journal of the Electrochemical Society. 143 (3): 1114–1123. doi:10.1149/1.1836594. ^ a b c d e "Lithium Ion technical handbook" (PDF). Gold Peak Industries Ltd. November 2003. Archived from the original (PDF) on 7 October 2007. ^ Younesi, Reza; Veith, Gabriel M.; Johansson, Patrik; Edström, Kristina; Vegge, Tejs (2015). "Lithium salts for advanced lithium batteries: Li–metal, Li–O 2, and Li–S". Energy Environ. Sci. 8 (7): 1905–1922. doi:10.1039/c5ee01215e. ^ Wenige, Niemann, et al. (30 May 1998). Liquid Electrolyte Systems for Advanced Lithium Batteries (PDF). cheric.org; Chemical Engineering Research Information Center(KR). Retrieved 11 June 2010. ^ "UMD & Army Researchers Discover Salty Solution to Better, Safer Batteries". Battery Power. December 2015. Retrieved 10 July 2018. ^ Syzdek, J. A.; Borkowska, R.; Perzyna, K.; Tarascon, J. M.; Wieczorek, W. A. A. (2007). "Novel composite polymeric electrolytes with surface-modified inorganic fillers". Journal of Power Sources. 173 (2): 712–720. Bibcode:2007JPS...173..712S. doi:10.1016/j.jpowsour.2007.05.061. ^ Reiter, J.; Nádherná, M.; Dominko, R. (2012). "Graphite and LiCo1/3Mn1/3Ni1/3O2 electrodes with piperidinium ionic liquid and lithium bis(fluorosulfonyl)imide for Li-ion batteries". Journal of Power Sources. 205: 402–407. doi:10.1016/j.jpowsour.2012.01.003. ^ Can, Cao; Zhuo-Bin, Li; Xiao-Liang, Wang (2014). "Recent Advances in Inorganic Solid Electrolytes for Lithium Batteries". Frontiers in Energy Research. 2: 1–10. doi:10.3389/fenrg.2014.00025. ^ Zogg, Cornelia (14 June 2017). "A solid-state electrolyte that is able to compete with liquid electrolytes for rechargeable batteries". Phys.org. Retrieved 24 February 2018. ^ Can, Cao; Zhuo-Bin, Li; Xiao-Liang, Wang (2014). "Recent Advances in Inorganic Solid Electrolytes for Lithium Batteries". Frontiers in Energy Research. 2: 2–4. doi:10.3389/fenrg.2014.00025. ^ Can, Cao; Zhuo-Bin, Li; Xiao-Liang, Wang (2014). "Recent Advances in Inorganic Solid Electrolytes for Lithium Batteries". Frontiers in Energy Research. 2: 6–8. doi:10.3389/fenrg.2014.00025. ^ Tatsumisago, Masahiro; Nagao, Motohiro; Hayashi, Akitoshi (2013). "Recent development of sulfide solid electrolytes and interfacial modification for all-solid-state rechargeable lithium batteries". Journal of Asian Ceramic Societies. 1 (1): 17. doi:10.1016/j.jascer.2013.03.005. ^ Linden, David and Reddy, Thomas B. (eds.) (2002). Handbook of Batteries 3rd Edition. McGraw-Hill, New York. chapter 35. ISBN 0-07-135978-8. ^ Zhai, C; et al. (2016). "Interfacial electro-mechanical behaviour at rough surfaces". Extreme Mechanics Letters. 9: 422–429. doi:10.1016/j.eml.2016.03.021. ^ "Design Review For: Advanced Electric Vehicle Battery Charger, ECE 445 Senior Design Project". 090521 courses.ece.illinois.edu. Archived from the original on 4 May 2013. ^ a b "Lithium Ion Rechargeable Batteries. Technical Handbook" (PDF). Archived from the original (PDF) on 11 April 2009. ^ "Custom Lithium ion Battery Pack Manufacturer". LargePower. Retrieved 16 March 2015. ^ "Overview of lithium ion batteries" (PDF). Panasonic. January 2007. Archived (PDF) from the original on 7 November 2011. ^ Andrea 2010, p. 12. ^ Turpen, Aaron (16 November 2015). "New battery tech gives 10 hours of talk time after only 5 minutes on charge". www.gizmag.com. Retrieved 3 December 2015. ^ Smith, Noah (16 January 2015). "Get Ready For Life Without Oil". bloombergview.com. Retrieved 31 July 2015. ^ Randall, Tom; Lippert, John (24 November 2017). "Tesla's Newest Promises Break the Laws of Batteries". Bloomberg.com. Retrieved 13 February 2018. ^ a b "Lithium-Ion Batteries". Sigma Aldrich. Sigma Aldrich. ^ a b Nitta, Naoki; Wu, Feixiang; Lee, Jung Tae; Yushin, Gleb (2015). "Li-ion battery materials: present and future". MaterialsToday. 18 (5): 252–264. doi:10.1016/j.mattod.2014.10.040. ^ Fergus, Jeffrey (2010). "Recent developments in cathode materials for lithium ion batteries". Journal of Power Sources. 195 (4): 939–954. Bibcode:2010JPS...195..939F. doi:10.1016/j.jpowsour.2009.08.089. ^ Eftekhari, Ali (2017). "LiFePO4/C Nanocomposites for Lithium-Ion Batteries". Journal of Power Sources. 343: 395–411. Bibcode:2017JPS...343..395E. doi:10.1016/j.jpowsour.2017.01.080. ^ "Imara Corporation website". Imaracorp.com. Archived from the original on 22 July 2009. Retrieved 8 October 2011. ^ O'Dell, John (17 December 2008). Fledgling Battery Company Says Its Technology Boosts Hybrid Battery Performance Green Car Advisor; Edmunds Inc. Retrieved 11 June 2010. ^ a b LeVine, Steve (27 August 2015). "Tesla's coattails are carrying along Panasonic, but a battle for battery supremacy is brewing". Quartz. Retrieved 19 June 2017. ^ Loveday, Eric (23 April 2010). "Hitachi develops new manganese cathode, could double life of li-ion batteries". Retrieved 11 June 2010. ^ Nikkei (29 November 2009). Report: Nissan On Track with Nickel Manganese Cobalt Li-ion Cell for Deployment in 2015 Green Car Congress (blog). Retrieved 11 June 2010. ^ EnerDel Technical Presentation (PDF). EnerDel Corporation. 29 October 2007..
^ Elder, Robert and Zehr, Dan (16 February 2006). Valence sued over UT patent Austin American-Statesman (courtesy Bickle & Brewer Law Firm)..
^ Bulkeley, William M. (26 November 2005). "New Type of Battery Offers Voltage Aplenty, at a Premium". The Day. p. E6. ^ A123Systems (2 November 2005). A123Systems Launches New Higher-Power, Faster Recharging Li-Ion Battery Systems Green Car Congress; A123Systems (Press release). Retrieved 11 May 2010. ^ Blomgren, George E. (2016). "The Development and Future of Lithium Ion Batteries". Journal of the Electrochemical Society. 164: A5019–A5025. doi:10.1149/2.0251701jes. ^ "Samsung INR18650-30Q datasheet" (PDF). ^ a b Hayner, CM; Zhao, X; Kung, HH (1 January 2012). "Materials for Rechargeable Lithium-Ion Batteries". Annual Review of Chemical and Biomolecular Engineering. 3 (1): 445–471. doi:10.1146/annurev-chembioeng-062011-081024. PMID 22524506. ^ Eftekhari, Ali (2017). "Low Voltage Anode Materials for Lithium-Ion Batteries". Energy Storage Materials. 7: 157–180. doi:10.1016/j.ensm.2017.01.009. ^ "Northwestern researchers advance Li-ion batteries with graphene-silicon sandwich | Solid State Technology". Electroiq.com. November 2011. Archived from the original on 15 March 2018. Retrieved 3 January 2019. Zhao, X.; Hayner, C. M.; Kung, M. C.; Kung, H. H. (2011). "In-Plane Vacancy-Enabled High-Power Si-Graphene Composite Electrode for Lithium-Ion Batteries". Advanced Energy Materials. 1 (6): 1079–1084. doi:10.1002/aenm.201100426. ^ Ozols, Marty (11 November 2009). Altair Nanotechnologies Power Partner – The Military. Systemagicmotives (personal webpage)[dubious – discuss]. Retrieved 11 June 2010. ^ Gotcher, Alan J. (29 November 2006). "Altair EDTA Presentation" (PDF). Altairnano.com. Archived from the original (PDF) on 16 June 2007. ^ Synthetic Carbon Negative electrode Boosts Battery Capacity 30 Percent | MIT Technology Review. Technologyreview.com (2 April 2013). Retrieved 16 April 2013. ^ Newman, Jared (23 May 2013). "Amprius Begins Shipping a Better Smartphone Battery". Time. Retrieved 4 June 2013. ^ Coxworth, Ben (22 February 2017). "Silicon sawdust – coming soon to a battery near you?". newatlas.com. Retrieved 26 February 2017. ^ Kasavajjula, U.; Wang, C.; Appleby, A.J. C.. "Nano- and bulk-silicon-based insertion anodes for lithium-ion secondary cells". Journal of Power Sources (2007) (163): 1003–1039. ^ Li, H.; Huang, X.; Chenz, L. C.; Zhou, G.; Zhang, Z. "The crystal structural evolution of nano-Si anode caused by lithium insertion and extraction at room temperature". Solid State Ionics (2000) (135): 181–191. ^ Gao, B.; Sinha, S.; Fleming, L.; Zhou, O. "Alloy Formation in Nanostructured Silicon". Advanced Materials. 13 (11): 816–819. doi:10.1002/1521-4095(200106)13:11<816::AID-ADMA816>3.0.CO;2-P.
^ a b Girishkumar, G.; McCloskey, B.; Luntz, A. C.; Swanson, S.; Wilcke, W. (2 July 2010). "Lithium−Air Battery: Promise and Challenges". The Journal of Physical Chemistry Letters. 1 (14): 2193–2203. doi:10.1021/jz1005384. ISSN 1948-7185. ^ "A Better Anode Design to Improve Lithium-Ion Batteries". Berkeley Lab: Lawrence Berkeley National Laboratory. Archived from the original on 4 March 2016. ^ a b Luo, Jiayan; Zhao, Xin; Wu, Jinsong; Jang, Hee Dong; Kung, Harold H.; Huang, Jiaxing (2012). "Crumpled Graphene-Encapsulated Si Nanoparticles for Lithium Ion Battery Anodes". The Journal of Physical Chemistry Letters. 3 (13): 1824–1829. doi:10.1021/jz3006892. PMID 26291867. ^ Summerfield, J. (2013). "Modeling the Lithium Ion Battery". Journal of Chemical Education. 90 (4): 453–455. Bibcode:2013JChEd..90..453S. doi:10.1021/ed300533f. ^ Andrea 2010, p. 229. ^ "Lithium-ion laptop battery". Ultrabook Batteries. Ritz Stefan. Retrieved 23 March 2014. ^ "A Guide to Choosing Best Power Tool Battery for Your Cordless Tools". Best Power Tools For Sale, Expert Reviews and Guides. 25 October 2018. Retrieved 31 October 2018. ^ Miller, Peter (10 January 2015). "Automotive Lithium-Ion Batteries". Johnson Matthey Technology Review. 59 (1): 4–13. doi:10.1595/205651315x685445. ^ "Silent 2 Electro". Alisport. Archived from the original on 17 February 2015. Retrieved 6 December 2014. ^ "Pipistrel web site". Retrieved 6 December 2014. ^ "Ventus-2cxa with FES propulsion system". Schempp-Hirth. Archived from the original on 2 April 2015. Retrieved 11 March 2015. ^ GR-3150-CORE, Generic Requirements for Secondary Non-Aqueous Lithium Batteries. ^ Zimmerman, A. H. (2004). "Self-discharge losses in lithium-ion cells". IEEE Aerospace and Electronic Systems Magazine. 19 (2): 19–24. doi:10.1109/MAES.2004.1269687. ^ Weicker, Phil (1 November 2013). A Systems Approach to Lithium-Ion Battery Management. Artech House. p. 214. ISBN 978-1-60807-659-8. ^ Abe, H.; Murai, T.; Zaghib, K. (1999). "Vapor-grown carbon fiber anode for cylindrical lithium ion rechargeable batteries". Journal of Power Sources. 77 (2): 110–115. Bibcode:1999JPS....77..110A. doi:10.1016/S0378-7753(98)00158-X. ^ Vetter, Matthias; Lux, Stephan (2016). "Rechargeable Batteries with Special Reference to Lithium-Ion Batteries" (PDF). Storing Energy. Fraunhofer Institute for Solar Energy Systems ISE. p. 205. doi:10.1016/B978-0-12-803440-8.00011-7. ISBN 9780128034408. ^ "Best rechargeable batteries (10+ charts, overviews and comparisons )". eneloop101.com. Retrieved 9 February 2019. ^ "How Lithium-ion Batteries Work". howstuffworks.com. 14 November 2006. ^ Untersuchungen von Polarisationseffekte an Lithium-Ionen-Batterien In: Promotion Dr. Marcel Wilka 19. Dezember 2013. ^ a b c d e f g h i j k l m n o p q r Voelker, Paul (22 April 2014). "Trace Degradation Analysis of Lithium-Ion Battery Components". R&D. Retrieved 4 April 2015. ^ Sazhin, S. V; Dufek, E. J; Gering, K. L (2016). "Enhancing Li-Ion Battery Safety by Early Detection of Nascent Internal Shorts". Journal of the Electrochemical Society. 164: A6281–A6287. doi:10.1149/2.0431701jes. ^ a b c d Waldmann, T.; Wilka, M.; Kasper, M.; Fleischhammer, M.; Wohlfahrt-Mehrens, M. (2014). "Temperature dependent ageing mechanisms in Lithium-ion batteries – A Post-Mortem study". Journal of Power Sources. 262: 129–135. Bibcode:2014JPS...262..129W. doi:10.1016/j.jpowsour.2014.03.112. ^ Leng, Feng; Tan, Cher Ming; Pecht, Michael (6 August 2015). "Effect of Temperature on the Aging rate of Li Ion Battery Operating above Room Temperature". Scientific Reports. 5 (1): 12967. Bibcode:2015NatSR...512967L. doi:10.1038/srep12967. PMC 4526891. PMID 26245922. ^ Cristo, L.M. & Atwater, T. B. Characteristics and Behavior of Cycled Aged Lithium Ion Cells. Fort Monmouth, NJ: U.S. Army Research. ^ Waldmann, T.; Bisle, G.; Hogg, B. -I.; Stumpp, S.; Danzer, M. A.; Kasper, M.; Axmann, P.; Wohlfahrt-Mehrens, M. (2015). "Influence of Cell Design on Temperatures and Temperature Gradients in Lithium-Ion Cells: An in Operando Study". Journal of the Electrochemical Society. 162 (6): A921. doi:10.1149/2.0561506jes. .
^ Andrea 2010, p. 9. ^ Liaw, B. Y.; Jungst, R. G.; Nagasubramanian, G.; Case, H. L.; Doughty, D. H. (2005). "Modeling capacity fade in lithium-ion cells". Journal of Power Sources. 140 (1): 157–161. Bibcode:2005JPS...140..157L. doi:10.1016/j.jpowsour.2004.08.017. ^ Tip: Condition your new cell phone’s battery to make it last longer (but be sure to condition it properly). Dottech.org (24 December 2011). Retrieved 16 April 2013. ^ Yadav, Antriksh (31 December 2010) Top 5 lithium-ion battery myths. Rightnowintech.com. ^ Spotnitz, R.; Franklin, J. (2003). "Abuse behavior of high-power, lithium-ion cells". Journal of Power Sources. 113 (1): 81–100. Bibcode:2003JPS...113...81S. doi:10.1016/S0378-7753(02)00488-3. ^ Finegan, D. P.; Scheel, M.; Robinson, J. B.; Tjaden, B.; Hunt, I.; Mason, T. J.; Millichamp, J.; Di Michiel, M.; Offer, G. J.; Hinds, G.; Brett, D. J. L.; Shearing, P. R. (2015). "In-operando high-speed tomography of lithium-ion batteries during thermal runaway". Nature Communications. 6: 6924. Bibcode:2015NatCo...6E6924F. doi:10.1038/ncomms7924. PMC 4423228. PMID 25919582. ^ Väyrynen, A.; Salminen, J. (2012). "Lithium ion battery production". The Journal of Chemical Thermodynamics. 46: 80–85. doi:10.1016/j.jct.2011.09.005. ^ "Lithium-ion Battery Charging Basics". PowerStream Technologies. Retrieved 4 December 2010. ^ Electrochem Commercial Power (9 September 2006). "Safety and handling guidelines for Electrochem Lithium Batteries" (PDF). Rutgers University. Retrieved 21 May 2009. ^ a b Mikolajczak, Celina; Kahn, Michael; White, Kevin & Long, Richard Thomas (July 2011). "Lithium-Ion Batteries Hazard and Use Assessment" (PDF). Fire Protection Research Foundation. pp. 76, 90, 102. Archived from the original (PDF) on 13 May 2013. Retrieved 27 January 2013. ^ Cringely, Robert X. (1 September 2006). "Safety Last". The New York Times. Retrieved 14 April 2010. ^ Kanellos, Michael (15 August 2006). "Can anything tame the battery flames?". Cnet. Retrieved 14 June 2013. ^ Topham, Gwyn (18 July 2013). "Heathrow fire on Boeing Dreamliner 'started in battery component'". The Guardian. ^ "Boeing 787 aircraft grounded after battery problem in Japan". BBC News. 14 January 2014. Retrieved 16 January 2014. ^ a b Hanisch, Christian; Diekmann, Jan; Stieger, Alexander; Haselrieder, Wolfgang; Kwade, Arno (2015). "27". In Yan, Jinyue; Cabeza, Luisa F.; Sioshansi, Ramteen (eds.). Handbook of Clean Energy Systems – Recycling of Lithium-Ion Batteries (5 Energy Storage ed.). John Wiley & Sons, Ltd. pp. 2865–2888. doi:10.1002/9781118991978.hces221. ISBN 9781118991978. ^ Hanisch, Christian. "Recycling of Lithium-Ion Batteries" (PDF). Presentation on Recycling of Lithium-Ion Batteries. Lion Engineering GmbH. Retrieved 22 July 2015. ^ Kamyamkhane, Vaishnovi. "Are lithium batteries sustainable to the environment?". Alternative Energy Resources. Archived from the original on 17 September 2011. Retrieved 3 June 2013. ^ Application of Life-Cycle Assessment to Nanoscale Technology: Lithium-ion Batteries for Electric Vehicles (Report). Washington, DC: U.S. Environmental Protection Agency (EPA). 2013. EPA 744-R-12-001. ^ "Can Nanotech Improve Li-ion Battery Performance". Environmental Leader. 30 May 2013. Archived from the original on 21 August 2016. Retrieved 3 June 2013. ^ "How "Green" is Lithium?". 16 December 2014. ^ "European Commission, Science for Environment Policy, News Alert Issue 303" (PDF). October 2012. ^ Franco, Alejandro (7 April 2015). Rechargeable lithium batteries : from fundamentals to applications. Franco, Alejandro A. Cambridge, UK. ISBN 9781782420989. OCLC 907480930. ^ "Kyocera Launches Precautionary Battery Recall, Pursues Supplier of Counterfeit Batteries" (Press release). Kyocera Wireless. 28 October 2004. Archived from the original on 7 January 2006. Retrieved 15 June 2010. ^ Tullo, Alex (21 August 2006). "Dell Recalls Lithium Batteries". Chemical and Engineering News. 84 (34): 11. doi:10.1021/cen-v084n034.p011a. ^ Hales, Paul (21 June 2006). Dell laptop explodes at Japanese conference. The Inquirer. Retrieved 15 June 2010. ^ "Nokia issues BL-5C battery warning, offers replacement". Wikinews. 14 August 2007. Retrieved 8 October 2009. ^ Nokia N91 cell phone explodes. Mukamo – Filipino News (27 July 2007). Retrieved 15 June 2010. ^ "Samsung pins explosive Galaxy Note 7 on battery flaw". Retrieved 18 September 2016. ^ a b c d e United States Code of Federal Regulations, Title 49: Transportation, Subtitle B: Other regulations relating to transportation, Chapter I: Pipeline and hazardous materials safety administration, department of transportation, Subchapter C: Hazardous materials regulations, Part 175: Carriage by aircraft, Subpart A: General information and regulations, Section 10: Exceptions for passengers, crewmembers, and air operators, 49 C.F.R. 175.10. ^ Galbraith, Rob (3 January 2008). "U.S. Department of Transportation revises lithium battery rules press release". Little Guy Media. Archived from the original on 23 November 2008. Retrieved 11 May 2009. ^ Prohibitions – 6.3.12 – Dangerous, offensive and indecent articles Archived 1 May 2014 at the Wayback Machine (PDF). Hong Kong Post Office Guide. December 2009. Retrieved 15 June 2010. ^ International Mail > FAQs > Goods/Services: Shipping a Laptop. Japan Post Service Co. Ltd. Retrieved 15 June 2010. ^ "Posting Restricted Items Overseas & UK". Royal Mail. ^ Ungerleider, Neal. USPS To Stop Delivering iPads And Kindles To Troops And Overseas Consumers On 16 May. USPS. ^ Just in Time for the Holidays, U.S. Postal Service to Begin Global Shipping of Packages with Lithium Batteries. USPS. 9 November 2012. ^ "Airlines Stop Taking Lithium Battery Shipments". YouTube. 3 March 2015. ^ "Lithium ion cells for Aerospace applications: LVP series" (PDF). GS UASA. Retrieved 17 January 2013. ^ Dalløkken, Per Erlien (17 January 2013). "Her er Dreamliner-problemet" (in Norwegian). Teknisk Ukeblad. Retrieved 17 January 2013. ^ Grant Martin (18 January 2018). "Airline Smart Luggage Ban Goes Into Effect". Forbes. ^ Dani Deahl (9 February 2018). "Airlines are mistakenly stopping approved smart luggage from being carried on flights". The Verge. ^ Callum Tennent (6 June 2018). "Big brands go bust as smart luggage is banned on major US airlines". Which. Andrea, Davide (2010). Battery Management Systems for Large Lithium-Ion Battery Packs. Artech House. p. 234. ISBN 978-1608071043. Retrieved 3 June 2013. Winter, M; Brodd, RJ (2004). "What Are Batteries, Fuel Cells, and Supercapacitors?". Chemical Reviews. 104 (10): 4245–69. doi:10.1021/cr020730k. PMID 15669155. 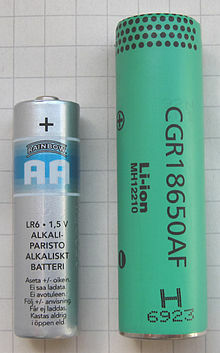 Wikimedia Commons has media related to Lithium-ion batteries. Degradation Mechanisms and Lifetime Prediction for Lithium-Ion Batteries – A Control Perspective, National Renewable Energy Laboratory, July 2015. IATA. Dangerous Goods (Hazmat): Lithium Batteries – Guidance. Lithium-Ion battery charging using the CC-CV method - a detailed theoretical explanation and a practical implementation on Arduino.